I live and work in downtown Lincoln Nebraska. The pace here is a little slower than in a very large city, but the opportunities for exhibition are just as accessible. The art community here is vital, varied and active. All of my life I have been surrounded by fibers, threads, fabrics, paint and dyes. I studied formally at university for a few years, and I have taken classes through the Textile, Clothing & Design department at the University of Nebraska. The majority of my education has been through experimentation, observation, and trial and error. I would like the viewer to be impacted by my work in some way. By using layers of thread and cloth I strive to create images that invite the viewer to consider, wonder and invent stories of their own. They may be intrigued by the use or amount of thread, they may be touched by an emotion that they recognize, they may wonder, smile or create their own story for the piece. I would love them to see my works as stories waiting to be told. What drew you to old photographs and what meaning do they bring to your work? A sense of time or time period are reasons that I am inspired to use photographs as a jumping off point for my works. Old photographs have always evoked the storyteller in me. I am free to imagine. I become the detective that wonders – Who are the people? What are they doing? How did they get there? Where and when is there? Answering all of these questions through thread and cloth evokes the same response to those who view my pieces. They provide stories of their own. The ideas begin with thread and fiber in mind, drawn in fluid contour lines with pencil and paper. They are conceived with the express purpose of being produced with thread and fiber, line and stitch, patterns and layers. Stitching allows me to think in terms of line. Layers and layers of line creating form shape and depth dimension and texture. A lot of your work seems to reference women, can you talk about this a bit? Images of women are featured in my works because like the old adage, I do what I know best. I know women. They are my friends and part of my family. Through my relationships with them, I have become familiar with their emotions and the depth of character that can be seen on their faces. I wanted to portray their personal histories. Creating portraits of women allows me to share universal feelings of friendship, loss, joy, longing and hope. My best friends are women. I know the curve of their cheek, the sturdiness of their stance, their emotions, their friendships, their children. I find that I am drawn to telling their stories because I know their stories. I share their emotions. They are friends of mine, or sisters from another time, or just someone who I would like to know. I am grateful to be able to tell their stories and to share these women with those who view my pieces. Your background is in quilting, how does this affect, both good and bad, how you approach your needle work? My history with fabric and thread has taken many forms including, batik, weaving, dressmaking, and quilting. All of these have informed my work. There really is no downside to being a quilter. Being a quiltmaker opened up another world for me through the creation of pattern, line and figure. Initially its structure helped me to concentrate on color and line. From there, breaking the traditional boundaries became a challenge. As a portrait maker, it became imperative that I break the rules, stretch the boundaries and use fabric and thread in new and different ways. The fluid lines, the selection of fabrics, the making of pattern has combined enabling me to produce unique portraits. I begin with a line drawing inspired by one or more photographs. I live with this drawing for some time, getting to know the people in the picture. When I have a good sense of who they are I begin cropping, editing and simplifying the shapes to create pattern pieces for each figure. Specific fabrics are chosen from my collection, to create the figure, set the scene, produce the portrait. 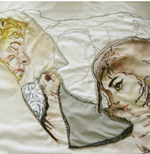 The faces are drawn onto a fabric base and are stitched using layers and layers of thread. I stitch with a variety of weights, shades and colors of thread to create shadow, shade and depth to the applique. On your website you mention your “small work” breaks- can you talk about why you do this and how you think it nurtures your studio practice. I needed a way to try out techniques, ideas, materials and subjects without just doing practice pieces. I wanted them to relate to what I create on the big scale and be relevant. I call these projects, sketches really, my smalls as they usually finish no larger that 11×14. These pieces allow me to play with an idea, fabric combinations, stitching styles or media without investing too much in time or materials. They often let me explore color combinations, new products or a whimsy. They refresh me. Staying true to my uniqueness. It is difficult to find blocks of time that allow me get into the work and concentrate on the stitching. I strive to find my most productive time and use it to hone my skills and to develop my identity as an artist. When I first began working with fabric I gained proficiency in the use of the sewing machine through the production of traditional designs and patterns. I found joy in the selection and varied combinations of fabrics. In the beginning the figures that I created were simple, cartoonish and one-dimensional. I used fabric and thread in a more traditional ways. As I evolved, so too did the tools that were available to me. I began to innovate. I took advantage of better sewing machines, new tools and materials and the vast variety of threads. These tools made it possible for me to begin to create what I had only dreamt of. Developing a body of work that tells a story. Less fabric driven work, more stitching. Densely stitched portraits on a larger scale. The introduction of more artful techniques such as block prints, transfers, painting, drawing and handwritten text. I have a small 16×20 foot studio on the 2nd floor of an old building in downtown Lincoln. The lower level of the building houses a co-op gallery. It is a quiet and friendly place with some foot traffic. I wish that the light was better, but I do have 2 north-facing window. I strive to be active, focused and working there 20-25 hours a week (more if I can get it). My best creative time is usually from mid afternoon until 7 or 8pm. I try to schedule mundane tasks for the morning time. Arranging the space, bookkeeping, sorting/washing/storing fabrics. The afternoons are for the really creative work. Developing an idea, drawing the primary images, selecting fabrics, preparing the patterns, doing the stitching/drawing/painting. 1. Mary Cassett because of her use of line, shape and pattern. She used large areas in her pieces filled with bold patterns and designs. Her central figures are women & children. 2. Phyllis Moore is a contemporary quiltmaker. Her fabric selection is always surprising. Her openness to the idea is truly heartfelt and non-judgmental. She has developed great storytelling in her quilts through her fabric selection, stamping, resist, sunprints, texts and superb titles. 3. Georges Seurat was a French painter and draftsman. His large story telling works, created with his use of points of paint that create color, shade and shadow. I like to garden and putter with flowers, veggies, color and composition (even in the garden). My husband’s and my father are aging and we are helping with their care. Through our time together I have discovered the storyteller in my father (and myself). He shares tales of his adventurous/rambunctious youth. This has offered me the chance to look at him and our old photos from a different point of view. His stories are weaving their way into my work. Featured in Art Quilts: People & Portraits by Martha Sielman, a SAQA publication, LaConner Quilt & Textile Museum – Quilt Show, LaConner, Washington. So many opportunities to see Lora’s work and from experience it the magic happens when you see it in person. See more of Lora’s work here.